Maxim of Quantity An Animated and Narrated Glossary of Terms used in Linguistics presents. 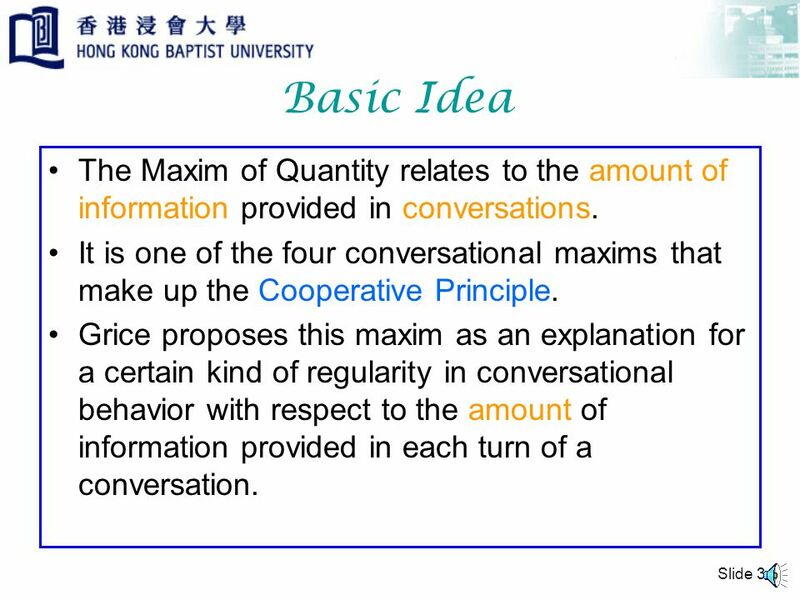 4 Slide 3 Basic Idea The Maxim of Quantity relates to the amount of information provided in conversations. It is one of the four conversational maxims that make up the Cooperative Principle. 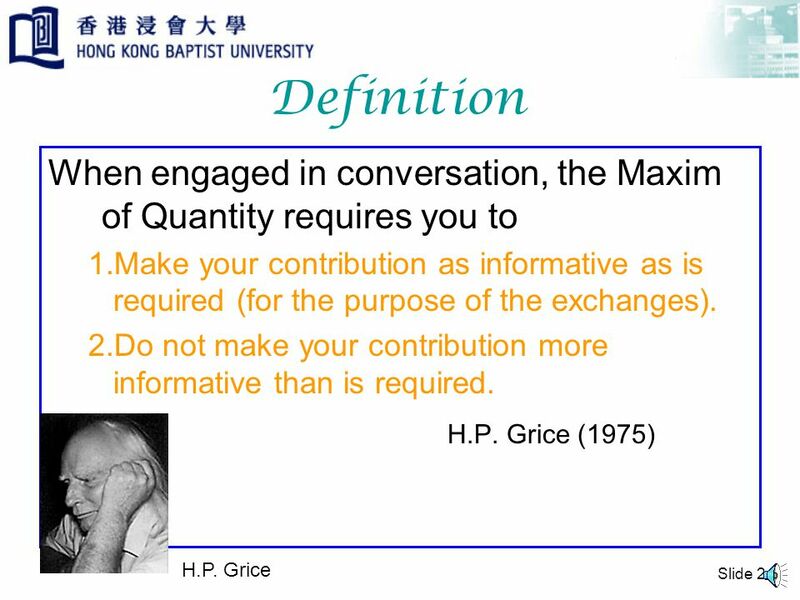 Grice proposes this maxim as an explanation for a certain kind of regularity in conversational behavior with respect to the amount of information provided in each turn of a conversation. 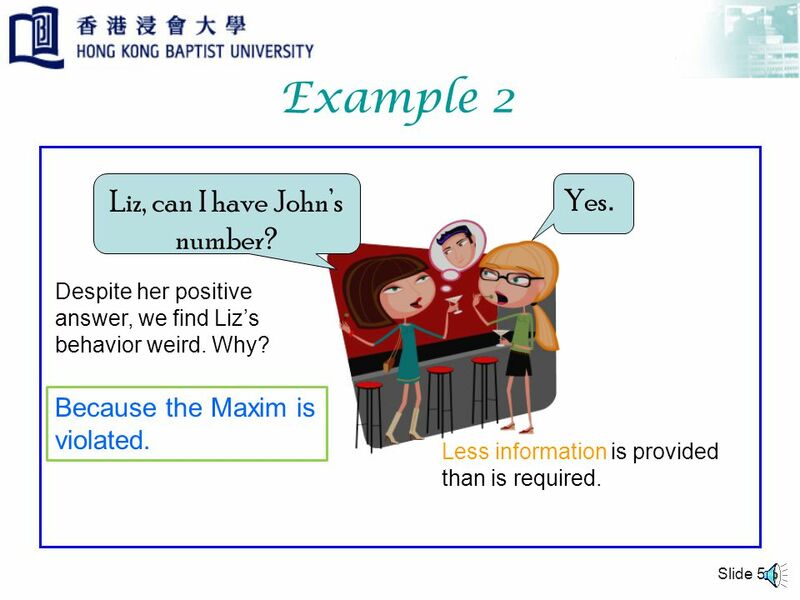 6 Slide 5 Example 2 Liz, can I have John’s number? Yes. Despite her positive answer, we find Liz’s behavior weird. Why? Because the Maxim is violated. Less information is provided than is required. 7 Slide 6 Flouting a Maxim Liz, can I have John’s number? Yes. In a case such as this, one might infer that Liz doesn’t have the number with her and will supply it later. Because we do not expect the Maxim to be violated, the apparent violation must be motivated. WHY? 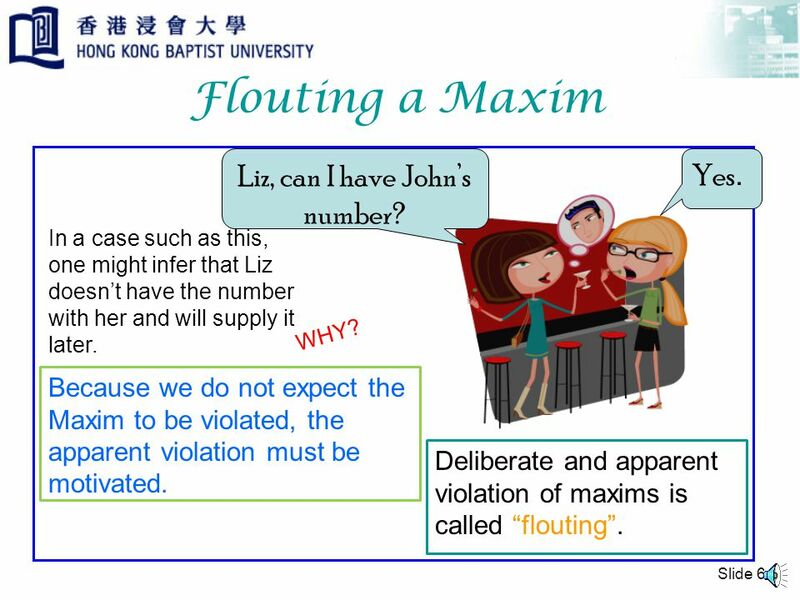 Deliberate and apparent violation of maxims is called “flouting”. 8 Implicatures Liz, can I have John’s number? Yes. Inferences obtained from flouting of maxims are called implicatures. 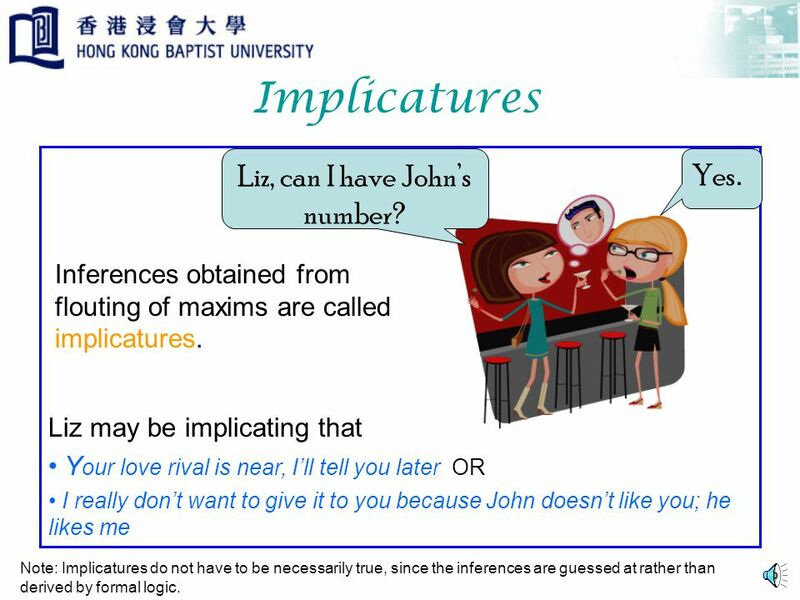 Liz may be implicating that Y our love rival is near, I’ll tell you later OR I really don’t want to give it to you because John doesn’t like you; he likes me Note: Implicatures do not have to be necessarily true, since the inferences are guessed at rather than derived by formal logic. 9 The End Wee, Lian-Hee and Winnie H.Y. 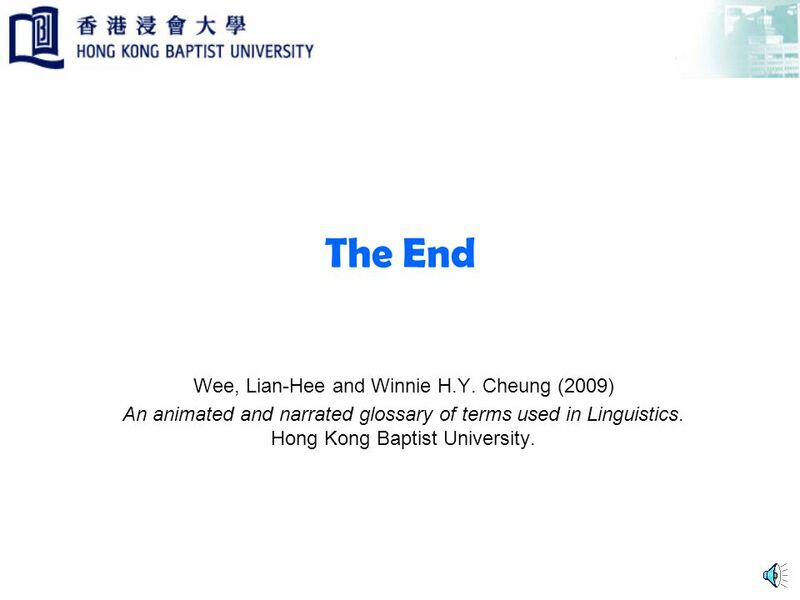 Cheung (2009) An animated and narrated glossary of terms used in Linguistics. Hong Kong Baptist University. 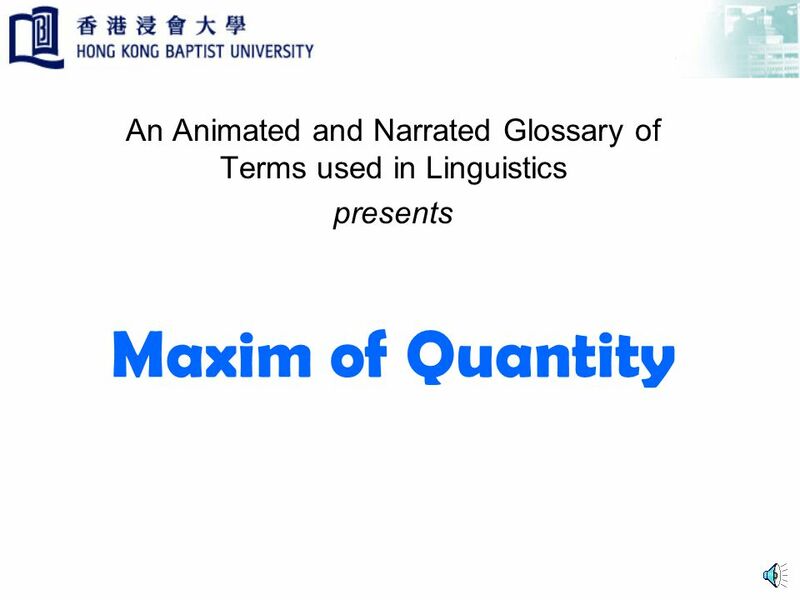 Download ppt "Maxim of Quantity An Animated and Narrated Glossary of Terms used in Linguistics presents." Constituency An Animated and Narrated Glossary of Terms used in Linguistics presents. 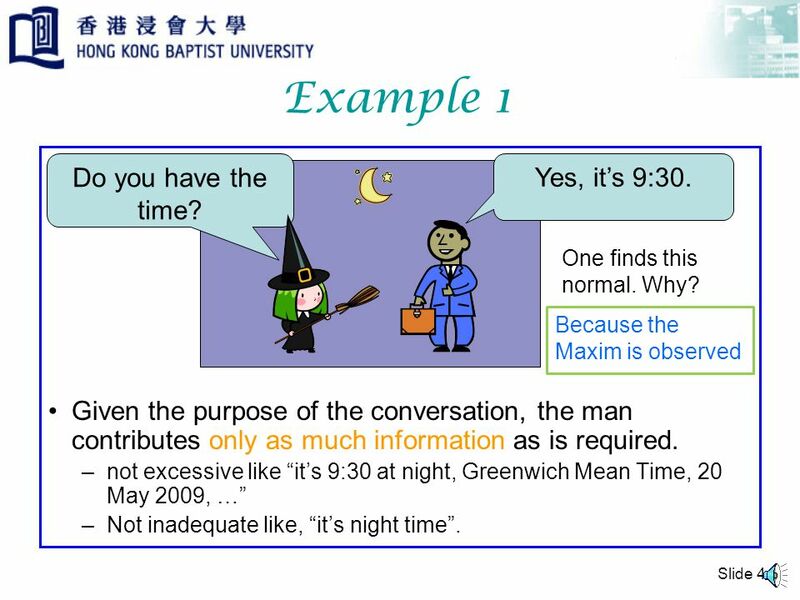 Inference An Animated and Narrated Glossary of Terms used in Linguistics presents NB: Inference is a philosophical topic which goes beyond the scope of. Assimilation An Animated and Narrated Glossary of Terms used in Linguistics presents. Day 4 More on Information Design and Theories of human computer interaction. Distinctive Feature An Animated and Narrated Glossary of Terms used in Linguistics presents. CAS LX 502 Semantics 9b. Presupposition, entailments, and implicatures 10.2, 11. Entailment An Animated and Narrated Glossary of Terms used in Linguistics presents. Voice Onset Time (VOT) An Animated and Narrated Glossary of Terms used in Linguistics presents. Phone An Animated and Narrated Glossary of Terms used in Linguistics presents. Subcategorization An Animated and Narrated Glossary of Terms used in Linguistics presents. Pragmatics is the study of how people do things with words. Subjacency An Animated and Narrated Glossary of Terms used in Linguistics presents. Yule, Cooperation and implicature Pertemuan 4 Matakuliah: G1042/Pragmatics Tahun: 2006. Natural Information and Conversational Implicatures Anton Benz.